Holy crap! This flick is so obscure that as of this writing (March 2016 — I like to get a head start on the Horrorshow) it has no Wikipedia page. It also has a common title. 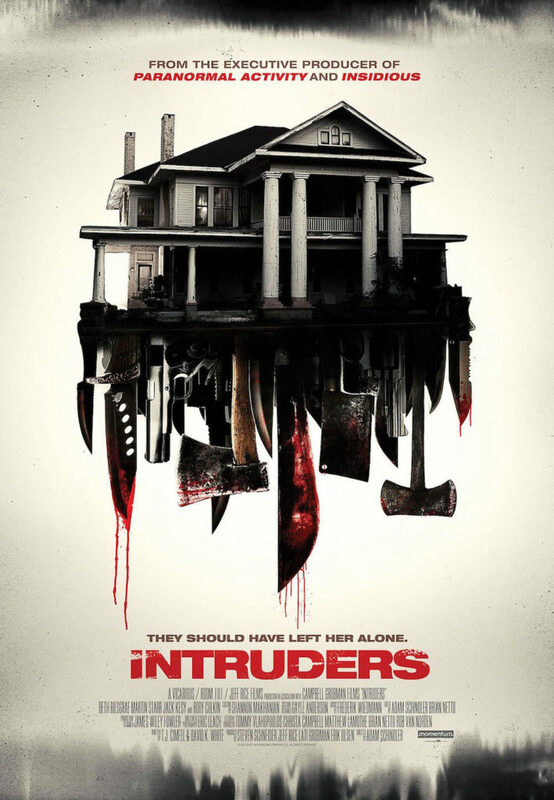 A quick search in the tubes turned up no less than three films titled Intruders produced from 2014-2016, not including this one. Some more digging has revealed that this Intruders was originally titled Shut In, and under that title there is a Wikipedia page. So all is well with the universe. Directed by Adam Schindler and written by TJ Cimfel and David White, Intruders tells the story of Anna Rook (Beth Riesgraf), a 30-something woman who is caring for her brother as he dies of cancer. The house they occupy is large, old, and depressing — the atmosphere not helped at all by the fact one of the siblings is dying in it. But, poor Anna can find no relief. She suffers from a crippling case of agoraphobia, having not gone beyond the threshold of the house in her adult life. There’s a bit more to it, but it’s not necessary to reveal any more. Anna’s isolation means she doesn’t have friends. The closest she has is the family lawyer (Leticia Jimenez), who only drops by to handle documents for Anna’s brother’s estate, and Dan (Rory Culkin), a local meals on wheels driver. Dan has a bit of a crush on Anna, and is genuinely concerned for her well-being during her brother’s final days. He offers his sympathy and understanding, and she offers him a bag full of cash so he can fulfill his dream of leaving the small town in which they live. What’s this? A bag of cash? It comes out of nowhere and catches both Dan and viewer off guard. For her part, Anna is blithely innocent and trusting, lacking an understanding of the human fetish for money. A few days later, it is time for Anna’s brother’s funeral, but Anna’s phobia keeps her from leaving the house. This is bad for Anna, as three sketchy-looking men arrive at the house when Anna should be at the funeral. They are JP, Perry, and Vance (Jack Kesy, Martin Starr, and Joshua Mikel). At this point in the film, viewers don’t know why there’s all that cash in the house, nor how the men, the intruders of the title, know about it, but it’s clear they have come to take it. By now, readers may be wondering why this film made the Horrorshow. Sure, it’s a thriller and, were any of us in Anna’s shoes, there would be a fair amount of fright, but there hasn’t been anything in the rundown above to point to this as a horror flick. I suppose the crossover from thriller to horror is a subtle one. For me that difference resides in the film’s intent. Who are the filmmakers trying to frighten? Protagonist or viewer? As Anna’s situation in the house becomes more desperate, the filmmakers swing the movie in a different direction. Anna tricks the home invaders into going into the basement. At the flip of a switch, the basement stairs slide back into the wall like high school gymnasium bleachers, and the bad guys are trapped. Anna has the upper hand, and it appears she always had. Anna and her brother have a dungeon, and three idiots have walked right into it. That’s why Intruders is a horror film. But then this promising turn of events is somewhat wasted. For a split second there is hope. It’s quick and disappears in a flash, but for that small moment, it appears Anna is a psychopath. Maybe she and her brother are serial killers, cannibals, or worse. Maybe they were just into serious kink. Whatever the reasons for the bag of tricks in the basement, I was looking forward to it resulting in buckets of blood. There is a reason for the basement chambers revealed, but it turns out to be more in line with the thriller nature of the film rather than any sort of horror aspect. That does mean Intruders is a questionable addition to the Horrorshow. But in that moment of anticipation, that sweet second when antagonists’ and protagonist’s control reverses, Intruders is a horror film extraordinaire. Had the filmmakers chosen to pursue that path, a better film would have been the result, I feel. It would have been more conventional, and run the risk of descending into fun house scares, but that’s the movie I wanted to see. Oh, well. I won’t hold my own expectations against Schindler and company. That wouldn’t be fair. Even though Anna doesn’t turn into Leatherface when she deals with her unwanted guests doesn’t make Intruders a failure. This is a tense film before the big reveal and it remains one after. The only beef I really have is that we viewers are subject to a bit of a bait and switch, but I feel that probably has more to do with the production company’s marketing than anything else. So, I was fooled by a trailer into watching a half-decent thriller expecting a horror flick, and now have a spot to fill in the Horrorshow. Are you happy, Black Fish Films?